are sisters we adopted from a pet supply store 10 months ago whose litter had been abandoned . They are super sweet, loving, and very attached to each other as they have never been separated. 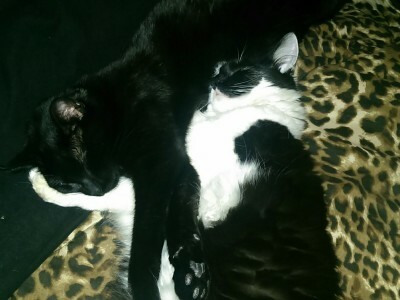 They need a new home together because I have discovered having a high energy 8 year old bopping around them , two older cats, and major construction projects going on is more then mama can handle! Though we love them a lot and will greatly miss them I know they deserve more serenity and attention. 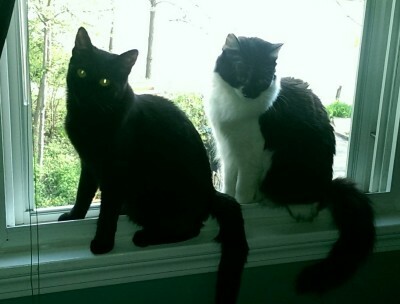 They are a year old, altered, have all shots up to date and are litter box trained. If you have room in your loving home for these sweet girls, please contact Joy, at 630 220-1115, or joycenter@aol.com.